The topic of water memory is a very controversial one. If you do a Google search for “water memory” you will find many posts about the topic, pro and con. 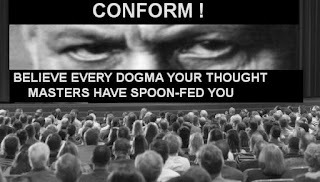 The more emotional ones seem to come from those who say the idea is bunk, and the more calm and reasoned ones seem to come from those presenting evidence for the idea. Thus far the term “water memory” has been used almost exclusively for the claim that water can retain a kind of memory or trace of substances it had previously contained, even though it has been diluted so much that there should be no molecules left of that substance. Mainstream scientists have long dismissed the idea with sneering contempt. But it became harder to do that once some distinguished scientists started presenting evidence for a “water memory” effect in which traces or effects of previous substances in water somehow survive even though the water has been diluted so much that all molecules of that substance should have disappeared. The first such scientist was Jacques Benveniste, who www.brittanica.com tells us was “responsible for numerous advances in allergy medicine and immunology.” He produced a paper that was accepted by the leading science journal Nature, a paper seeming to show an utterly anomalous water memory effect as described above. But the journal demanded he withdraw the paper after its editors realized that the reported results were scientific heresy. Benveniste was then demonized and denounced by the scientific community, and he was deprived of almost all funding. The treatment of Benveniste reflects very poorly on the culture of modern academic science, which sometimes seems to resemble the medieval church in its intolerance for heresy. Later another very distinguished researcher reported anomalous “water memory” results similar to Benveniste. This researcher was Luc Montagnier, who won the Nobel Prize in 2008 (along with two other researchers) for the discovery of the AIDS virus. Montagnier has done repeated experiments that supposedly support the water memory idea. His most interesting experiment is one described here, and in the long video you can see on that page. 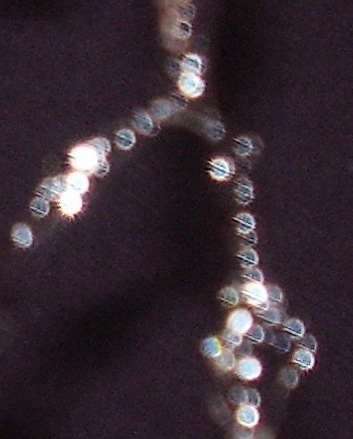 In the experiment, some DNA is put in some water, and the water is diluted to such a high degree that there should remain no molecule left of the DNA. The water is then examined for electromagnetic signals. The data from such signals is transmitted to another laboratory that has no knowledge of the original DNA sample. Then the other laboratory attempts to reconstruct the DNA from the signal data (something that should be impossible). Supposedly the experiment produced a 98% match. Relevant scientific papers by Montagnier can be read here and here. An article here claims that Nobel Prize winner Brian Josephson also supports "the idea that water possesses memory." The Montagnier experiment is so astonishing that you could compare it to an experiment in which you write you name on a cutting board by pouring sugar, and then pour that sugar into a pitcher of water, asking someone to retrieve your name from the dissolved sugar in the water. It would seem to be almost a miracle if someone managed to do that. The experiment described above is one in which there is supposedly what we may call a dilution memory of water, in which very highly diluted water somehow maintains traces of something that was once in it. But we can imagine an entirely different type of "water memory" effect: what we may call a series memory of water. Imagine if, astonishingly, you were to one day pour water out of a cup, and you were to find the poured water forming into a sphere. Now imagine such an anomalous effect were to persist for 10 consecutive tries, even though you had refilled the cup with fresh water each time. Since the water you were experimenting with was seemingly remembering to perform in this anomalous way, we could call that a water memory effect. I have not observed this exact effect (which could only be observed in zero gravity), but I have observed things almost equally strange when photographing falling water drops. When photographing nothing but ordinary drops of pure, clean water, a certain type of inexplicable photographic anomaly (such as stripes in circular objects or holes in circular objects) will appear, with the anomaly appearing multiple times in a single photograph. 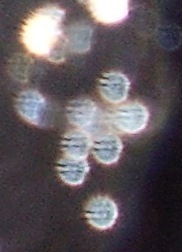 This anomaly will often continue to show up in multiple consecutive photographs, each using different samples of clean pure water, with the same type of photographic weirdness appearing in up to 100 consecutive photos, each photo showing multiple examples of the photographic weirdness (such as stripes in circular objects or holes in circular objects). After a certain number of consecutive photos showing the anomaly (usually less than 25 but sometimes as many as 100), the anomaly will stop appearing. Why could this be called a “water memory” effect? It is because it is rather as if for a certain length of time (lasting from twenty seconds to ten minutes) the water has a “memory” of the type of anomaly that is being displayed, resulting in the anomaly appearing in multiple consecutive photos. Let me give a particular example of how this kind of "water memory" effect occurred on a particular day. On March 16, 2019 I started photographing falling water drops. The first photos I took showed nothing unusual (at least nothing that I don't usually get when photographing water drops with my Sony A6000 camera). But at 9:31 AM I suddenly started getting a strong anomaly. 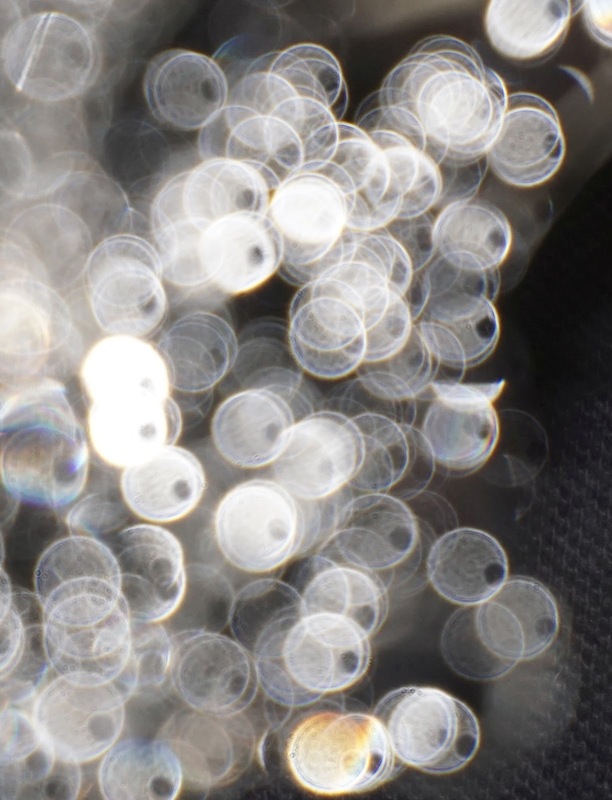 The falling water being photographed was full of circular objects with hole-like features. This anomaly continued for the next 100 photos I took. In all of those photos there were circular objects with hole-like features on the right; and all or almost all of the circular objects that appeared in each photo had hole-like features on the right. 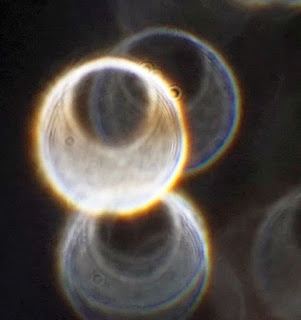 The 100 photos showed a total of more than 1000 of these orb holes, and in every single case the hole appeared on the right side of the orb, never on the left side. Below is an example of one of these photos, taken while only pure, clean water was falling. Finally at 9:42 AM after having taken 100 photos showing more than 1000 of these orb holes (all of them on the right side), the orb holes stopped appearing. I continued to get circular white orbs, but none of them with holes. You can see 80 such photos of orb holes by looking at this series of photos (keep pressing "Older Posts" at the bottom right to see them all). Whenever such an anomaly appears when I am photographing falling water drops, the anomaly almost always persists for multiple photographs, just as if some strange "water memory" effect was going on. Orb holes are not the only anomaly that I have got through such a "water memory" effect. I have also photographed an abundance of striped orbs while photographing nothing but pure, clean water drops falling. 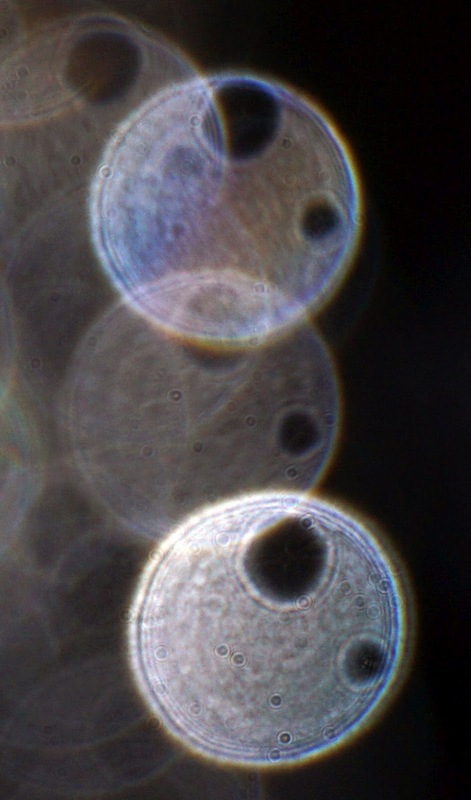 I get striped orbs most often when I am not photographing water drops, but am only photographing dry, clean air. 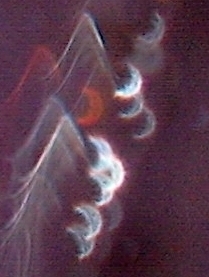 But while photographing falling water drops, I have often got striped orbs. Once such an anomaly started, it would often persist for multiple consecutive photos. The grid below shows some of the astonishing effects I have got while photographing only pure, clean water drops falling. You can see the original posts in which I took these photos by looking at this series of 61 posts (keep pressing "Older Posts" at the bottom to see them all). When these striped orbs had appeared while I was photographing clean ordinary drops of falling water, I would often see the startling anomaly occurring in consecutive photos, just as if some strange "water memory" effect was occurring. 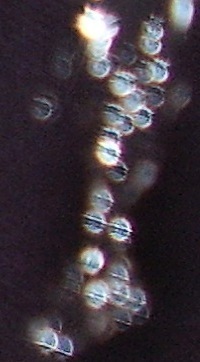 Below (from this post) is a startling example in which we see two streams of pure, clean water, both containing striped orbs. There are two shocking anomalies related to these photos and in the many similar photos you can see here and here. The first is that in these photos we see physical characteristics that we should never be able to see when falling water drops are being photographed. If you try putting some water drops on a plate or a sheet of aluminum foil, and use a needle to try to create water drops with holes or water drops with stripes, you will not be successful. The second anomaly is the fact that the first anomaly persists in multiple consecutive photos. I cannot prove that the second anomaly occurs, but the proof of the first anomaly is found in the 100+ photos I have published of these mysterious holes and stripes showing up when I photographed water drops. Some other photographers get similar results (see here for how to access one photographer's collection that has very many photos of mysterious orb holes and orb stripes). Another anomaly I have very often got when photographing falling water drops is the appearance of crescent shapes, which you can see in this series of 132 photos. Below is such a photo from 2016, in which a red crescent appeared while only pure, clean water was being photographed. Once such crescents show up, they often keep appearing in two or more consecutive photos. Perhaps even stranger is the type of anomaly shown here, which showed up in 347 photos. Interestingly, I do not get such dramatic anomalies most of the times that I photograph falling water drops. The stranger anomalies show up in only a minority of the times that I photograph falling water drops. Is there any hypothesis that might partially account for such anomalies and equally shocking anomalies reported by "water memory" researchers? I can imagine a kind of a mere fragment of a theory. It is generally believed that water always follows the same rules of behavior at any particular temperature and pressure. But let us imaginatively suppose that local quantities of water can have "local rules of behavior" for certain lengths of time. So, for example, we can imagine that one liter of water in Paris might temporarily have its own distinctive "local rule of behavior" that deviates dramatically from the rules of behavior of most other liters of water in the world; and we can imagine that some other liter of water in Shanghai might temporarily have its own distinctive "local rule of behavior" that deviates dramatically from the rules of behavior of most other liters of water in the world. Given such a strange possibility we might have a fragment of an explanation for these strange photos I have taken of striped orbs and orbs with holes appearing while water drops were falling. Conceivably what is temporarily going on is some "local rule of behavior" deviating dramatically from the norm. Something similar might be going on with the results reported by "water memory" researchers. What seems to be a "memory of water" could be a distinctive "local rule of behavior" peculiar to some particular water sample. Such local behavior deviations could conceivably be highly complex and information-rich, giving rise to experimental effects and medical effects that are otherwise inexplicable. I have no great confidence in such a speculation, but merely suggest it as a possibility to ponder. Another hypothesis that should be considered when discussing the possibility of "water memory" is the idea that information about past connections or experiences can be somehow mysteriously stored in a unit of matter, whether it be solid or liquid. There is a type of psychic phenomenon that seems to suggest just such a possibility: what is known as psychometry. A psychometrist is a type of psychic who will examine some object, and be able to give information about past events involving that object, information that the object's appearance never would have suggested. The article here from the Psi Encyclopedia describes various people who seemed to display such an ability, and how they sometimes did well when tested under controlled conditions. When psychometry seems to occur successfully, such a phenomenon seems to suggest that units of matter can somehow store a record of their past experiences, or information about things they were previously associated with. Such a thing could help explain experiments suggesting an anomalous "memory of water." Such an idea should not seem too outrageous when we remember that all forms of episodic human memory are mysterious and unexplained, and that claims that scientists understand episodic human memory are unfounded (existing physical theories on this topic being things that do not hold up well to scrutiny, and conflict with various facts such as the very high protein turnover in synapses). Such ideas might be relevant, but it would seem that we are very far indeed from any theory or set of theories that can account for all the bizarre anomalies that have appeared when experiments have been done with water and water has been photographed. Such evidence reminds us that man's knowledge of nature is merely fragmentary. The great majority of striped orbs that I have photographed have not appeared while I photographed falling water drops. They showed up instead while I was photographing clean, dry areas indoors and outdoors. 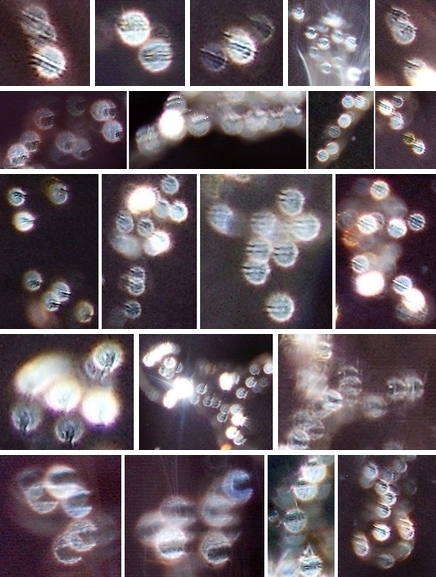 I have photographed more than 500 mysterious striped orbs as you can see in this long video, and they often have repeating patterns that you can see here. If anyone wants to try reproducing the strange effects described here, the post here describes exactly how I take such photos. Postscript: A recent science article was entitled "Quantum Machine Appears to Defy Universe's Push for Disorder." We read about a very strange effect rather reminiscent of the "series memory" effect I have described, one in which an ordered state of matter keeps reverting back to its previous state of order after being disrupted. The article even uses the term "memory" in referring to the weird effect, saying, "It’s as if the waves develop a memory of this special trajectory." So if "wave memory" is being shown by physicists, why is the idea of water memory taboo?